The portraits created by the great artist Nicholas Hilliard - the most famous ones are no bigger than your hand - so perfectly capture the faces of his era that they have become our own visual shorthand for Elizabethan and Jacobean times, every bit as much as the glorious paintings of his idol Hans Holbein. Hilliard rose to prominence at just the right time to have virtually all of the most powerful and influential people of his day and area as the objects of his art. And yet, despite this crucial role for an artist, Hilliard has for decades lacked a truly formidable biography. Business was booming. Hilliard was, as ever, hopeless at financial management. But his services were in demand in an extraordinary range and variety of media; he was without competition in the field of miniature painting; and he could count on his rich and powerful father-in-law for financial assistance when needed. Hilliard could not have realised it at the time but his personal and professional lives were at their apogee. Hilliard’s miniature continue to beguile - for their liveliness, their delicacy, their grace. Rarely do Hillard’s sitters appear static. Most seem on the verge of speaking, about to reveal an intimate confidence to the viewer. Many look directly, and penetratingly, into the viewer’s own eyes, creating the illusion of a connection, geographical distance and the passage of time notwithstanding. Even when greatly magnified, the most accomplished of HIlliard’s work suffer no loss of detail. This is fascinating stuff although at times a bit confusing; Hilliard’s subjects virtually never look directly into the viewer’s own eyes - their faces are almost always pointed offstage at some angle, with only their sparkling eyes turned to watch the viewer. Cumulatively, in the course of this big, beautifully-designed book, the effect of all those furtive glances is quite deliciously creepy. 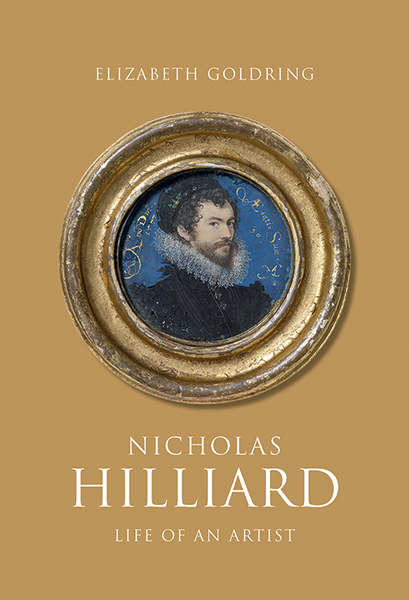 Nicholas Hilliard: Life of an Artist contains not only Hilliard’s own work in all its forms but also a wide array of contextual artwork that informed his aesthetic world; this wonderfully detailed biography is also a seminar in Tudor-era artwork. Yale University Press has spared no expense in the creation of this oversized volume, and the result is magnificent.